Of course, they love the water after a little encouragement. Poodles were originally breed to be retrievers and used for duck hunting dogs. It is only natural for this mix to want to dive right in and enjoy a swim. 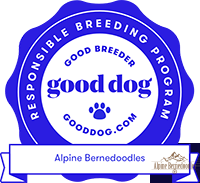 What makes Alpine Bernedoodles different from other breeders of bernedoodles? I have been a veterinary technician for over 16 years and the constant pursuit of perfection has always been my philosophy, I am constantly learning, listening and growing as a breeder and striving for the quality of my bernedoodles and the quality of my program to raise the healthiest and best puppies possible . All of our breeding dogs have full genetic health testing done according to breed specifics, as well as preliminary Hip and Elbow radiographs done by EVET/Dr. Wallace before entering into our breeding program. My main goal is to offer a happy, healthy puppy that will bring many years of companionship to your family. When will I know my number on the master list? You will be assigned a number when your deposit is received. I revise the master list for each type of litter after the selection process is complete. Each person remaining on the master list will receive an email with the updated list so you are aware of what your number will be for the next upcoming litter. Because everyone has the option to pick or pass on any litter, you may have the opportunity to choose a puppy sooner than later. You never know when you will get that special call, so be prepared! How will I be notified when it’s my turn to choose a puppy? I will send an email out to everyone on the master list for a particular litter type when the puppies are about 4 weeks old. I will let you know the date that I plan to begin the selection process. Please let me know if you will have any conflict with the timing so that we can make arrangements to discuss the puppies. This process does take several days and everyone is anxious to select their puppy. I will try to contact you by text, email and phone, if I am unable to reach you within 24 hours, I will have to move to the next person on the list. I post photo’s of the puppies on the website as well as the Alpine Bernedoodles Family and Friends private Facebook group page at newborn, 1, 3, 5 and 7 weeks of age. Individual videos are done at 5 weeks old to give you a real look at each puppy. I will begin calling the first person on the list and as puppies are chosen, I will mark them as sold on our Alpine Bernedoodles Family and Friends page. Each person has up to 24 hours to make their selection, everyone on the list is anxious to choose, we feel that this is adequate time to decide. Each person has the option to pick or pass on any litter, so there could always be a chance to choose a puppy even if your number is beyond the number of puppies born in the litter. When will my puppy be ready to go home? The Mini and Australian Bernedoodle puppies are ready for their furever homes beginning at 8 weeks of age. The micro-mini’s will be ready at 10 weeks due to their petite size. If you cannot receive your puppy during the go home week, they can stay here through the week for no charge. After the go home week, a $20 per day fee will be charged. Is it safe to ship my puppy by air? I ship with United Airlines exclusively. The United PetSafe department does an amazing job of booking, tracking and customer service. The puppies are in climate controlled pressurized compartments in the plane. They are transported to and from the plane in heated/air-conditioned vans and are not left on the tarmac. We have never had a puppy emotionally or physically traumatized from flying and it is a very safe and humane mode of travel. Will my puppy receive vaccinations? The puppies receive their first vaccinations and veterinary exam at 6 weeks of age. Puppies are vaccinated every 3-4 weeks and will be ready for their 2nd vaccination shortly after going home. If your puppy is staying with us beyond 9 weeks, they will receive their next vaccination. The puppies will also receive regular scheduled deworming at 2, 4, and 6 week of age. Your Veterinarian will schedule the next vaccinations and deworming according to their protocol. Will my puppy be micro-chipped? Your puppy will receive a micro chip prior to going home. The chip will be pre-registered with your information after full payment is received. You will receive an e-mail from Petlink.net welcoming you and information on how to set up an account to fully register your puppy. You will also receive more information regarding PetLink.net in your final puppy packet. What do I need to bring when I pick up my puppy? 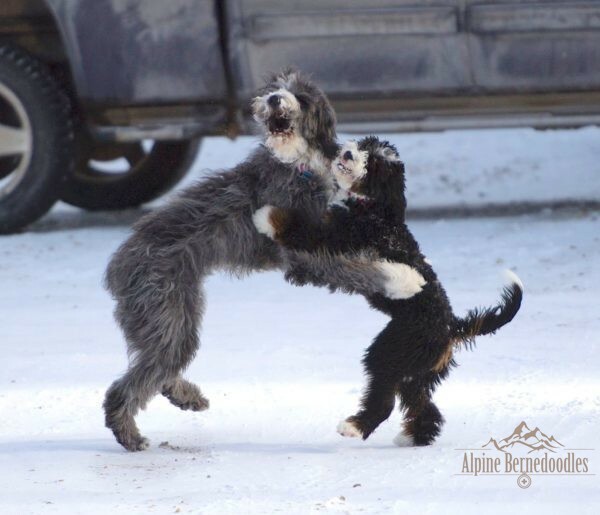 Whether picking up at Alpine Bernedoodles or the airport, we recommend that you bring a bath towel, paper towels and garage bag are always handy just in case a clean up is needed, along with water and a food and water bowl. When being shipped, the pups are not feed during their flight unless they have a long layover, a small ziplock bag of food will be attached to the crate when you received you puppy, along with a collar and leash. You will need photo ID to receive your puppy from the airline. When do I need to take my new puppy to the vet? The puppies come with a health guarantee which requires you to have your pup checked by a Veterinarian within 72 hours after receiving your puppy. You will receive a health record and vaccination history to take with you to your vet visit. A copy of the exam visit and any doctors notes will need to be sent to me for the health guarantee to be valid. Do you choose a puppy for me? No, puppy selection begins between 5-6 weeks old, this gives the puppies time to develop physically and emotionally. I observe the puppies and note the personality of each puppy as they grow. By 6 weeks of age they have developed enough distinct personality to assist you in your selection. The information you add to your application is very helpful for me to suggest puppies that would fit your lifestyle, but ultimately you make the final decision. Can I come and pick out my puppy in person? I allow one visit per family on the master list. If you would like to see the puppies prior to the picking process, arrangements must be made to see the litter just before the picking process begins. This will give you an idea of which ones you might be interested in, but there will be no guarantee that a particular puppy will still be available when it is your turn to choose. When is the balance due for my new puppy? The balance including shipping fees will be due after you have selected your puppy. I will send final documents to you to sign and return with your final payment. If you plan to send a check for final payment, please send it express mail to allow time for bank clearance. PayPal is another option, and a 3% fee will be added to the final amount. Travel arrangements will not be completed until full payment has been received. Is there a way to test and see if I am allergic to bernedoodles? Yes, if you are in the area, Marley is more than happy to be a test dog, she loves the attention! Another option is a childs t-shirt can be rubbed over one of the Bernedoodles and shipped to you. I have had good success with this option for people that have strong allergies. Can I take my puppy around town or the dog park right away? No, your puppy is not safe from contracting diseases until full vaccinated including Rabies. We want you to safely socialize your puppy as much as possible, but use good judgement. If you want to take them out to public places, carry them around. Take them to your friends and neighbors house to play with other dogs that you know have been vaccinated. Socializing at a young age is very important, but safety first! How often does my bernedoodle need to be groomed? Bernedoodles need regular brushing to keep from becoming matted. Professional grooming is usually needed about every 3 months, depending on how much you groom them and what type of look you like. Some like them keep short, while other families love the long doodle look. Keeping the hair trimmed around their eyes is usually necessary between professional grooming.